Snakes and spiders give most of us the creeps, but for Antwan Pettis, they are his inspiration and reason behind two of his passions: art and gardening. For those brave enough to come face to face with a snake, you’ll want to check out his artwork now on display as part of The Whole Person’s 9th Annual Expressions Art Exhibit. Antwan participates in both the gardening and arts programs as part of Swope Health’s Adult Day Program. Here, he finds safe, supportive outlets for his energy, creativity and curiosity. One of his images – a close-up illustration of the deadly puff adder snake – was recently selected by a panel of art experts to be included in the exhibit at Kansas City Young Audiences, 3732 Main St., Kansas City, MO. The exhibit showcases artists with disabilities, celebrating their abilities and unique talents. The show adds diversity to the Kansas City arts community and introduces audiences to art that otherwise might not be presented. The ninth annual exhibit will run at various locations throughout the community through February 2020. Antwan’s art, like the others on display, is available for sale after the show ends. 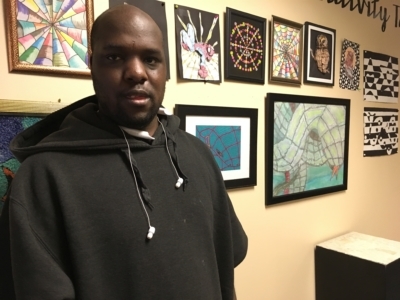 In the arts program, part of the Adult Community Psychiatric Rehabilitation Program (CPRP), led by Carolyn Graves, Community Support Specialist, Antwan learned a variety of techniques for drawing and working with markers, pastels and chalk. 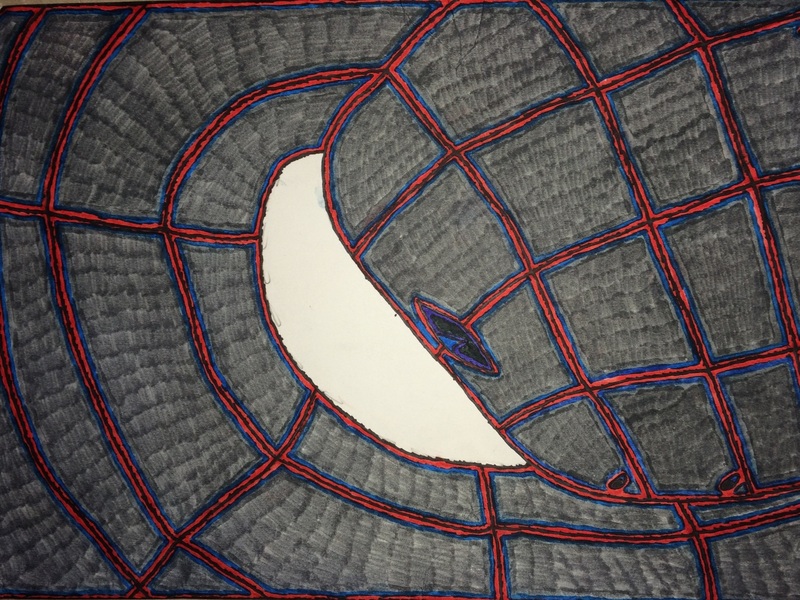 Combining his love of snakes, spiders, insects and reptiles with his art, he found a productive way to fuel both passions – as exemplified in his work in the exhibit. “I think it’s a very fascinating snake because of its patterns and its dual venom,” Antwan said. “It looks just like the rocks and debris it lives in. And it is both hemotoxic and neurotoxic.” Antwan explains that the snake’s venom attacks the blood as well as the nervous system of its prey. He learned about puff adders and related snakes in school, and is quick to note that he is always learning more. As a volunteer at Lakeside Nature Center for the last six years, he frequently works with birds of prey and wild animals. His goal is to become a reptile rehabilitator – one who works with injured reptiles. Part of his learning process involves personal research. He enjoys visiting area woods with his friends, where they look for snakes in the wild. If he finds any, he identifies the species and its gender, he measures it and estimates its age, and takes a picture. He keeps a detailed record of his findings. His interests in gardening also ties back to his fascination with insects and reptiles. When he learned that a friend’s rhinoceros iguana enjoys vegetables, he decided to take his share of eggplant and tomatoes from the Swope Health Day Program’s garden to the iguana. In addition to his interest in reptiles, he also draws comic books, sometimes featuring mythological beasts like Cerberus or the Hydra. Antwan said he always enjoyed drawing and began developing his skills in high school under the attention of a caring art teacher. Lenise James, Community Support Specialist, notes that Antwan has exhibited artwork before, at the Creations of Hope Gallery in Topeka, part of the Valeo Behavioral Health Care Center, as well as at the Midwest Ability Summit, an expo for the metro area organizations serving people with disabilities and older adults, as well as families, caregivers and healthcare professionals. He has also exhibited and sold items at the Swope Health Holiday Mart. You can find more examples of artwork produced by Antwan and other participants in the art program at Swope Heath Services, 3801 Blue Parkway, Kansas City, Mo., on exhibit in the main hallway of Building C.
National Child Abuse Prevention Month recognizes the importance of families and communities working together to prevent child abuse and neglect, while promoting the social and emotional well-being of children and families. 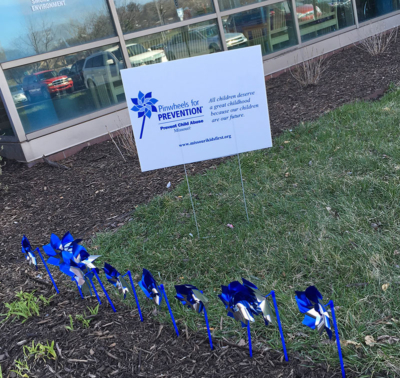 Find blue pinwheels in front of Swope Health Central on Blue Parkway in Kansas City, Mo. Since 2008, the pinwheel has been a symbol for the “Pinwheels for Prevention” campaign. “These pinwheels represent the great childhoods all children deserve and the prevention efforts that help them happen,” said Margaux Lemmones, Clinical Supervisor for Children’s Therapy and Adolescent Substance Use Disorder. Friday, April 5, is the National Go Blue Day – a day to wear blue as a reminder of the importance of taking action to prevent child abuse. 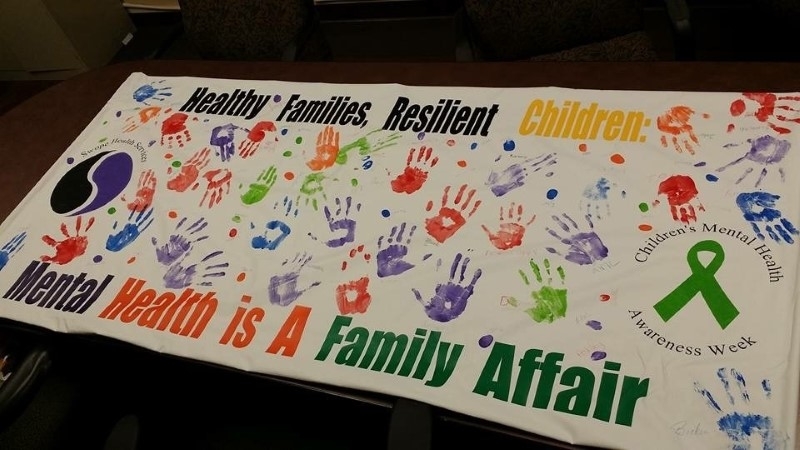 At Swope Health, staffers wearing National Child Abuse Prevention T-shirts will gather for a group photo, standing together to support prevention efforts. On Friday, April 12, associates from the Behavioral Health department will set up a table in the lobby of Swope Health Central, 3801 Blue Parkway, in Kansas City, Mo. to share information on ways to prevent child abuse. Visitors to the table will receive a pinwheel (while supplies last) along with materials like self-care for parents, resources for parents, important phone numbers and educational materials. For Swope Health associates, there will be a special program teaching ways to prevent child abuse from occurring and the importance of self-care for parents/caregivers/direct care providers that work with children. 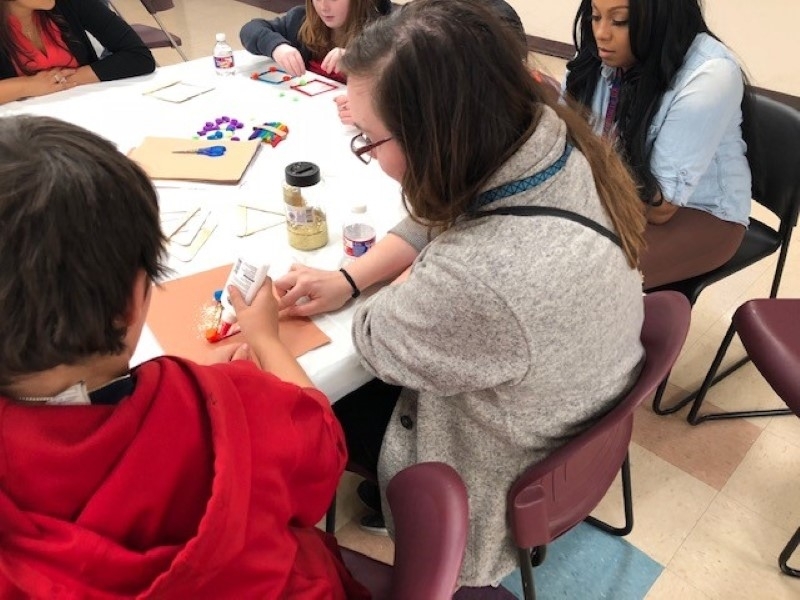 On Friday, April 26, from 9 a.m. to 4 p.m., Behavioral Health associates will host an art activity in the Children’s Conference Room on the second floor. Anyone who stops by can participate in an art activity to decorate a hexagon. At the end of the day, all the hexagons will be compiled together, interlinked. During the month of April and throughout the year, Swope Health also runs a Caregiver Support Group that focuses on teaching how adverse childhood experiences (ACEs) are a predictor of being at greater risk for alcoholism, depression, drug use, financial stress, suicide attempts, and more. The support group helps caregivers understand how their own traumas may affect the way they parent, Margaux said. The group promotes self-care and healing for the caregivers as a way to break generational cycles of abuse. “We want to create healthy environments for families to thrive,” Margaux said. 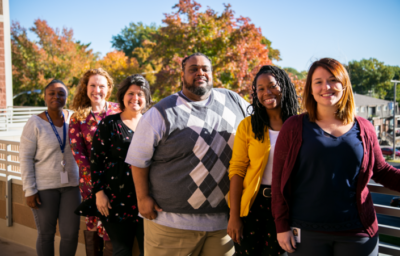 If you have questions about preventing child abuse or neglect, call 816-777-9892 to talk with one of the Swope Health Behavioral Health associates about resources or services. The 2019 Prevention Resource Guide focuses on protective factors that build on family strengths to foster healthy child and youth development. Tip Sheets are designed for parents or caregivers and to address a variety of topics including: Managing Stress, Keeping Your Family Strong, Dealing with Temper Tantrums, Building Resilience in Children and Teens, and many more. In this month when hearts are the decoration everywhere for Valentine’s Day, it is a good idea to think about your own heart. After all, February is “American Heart Month,” a designation sponsored by the American Heart Association. According to Healthfinder.gov, heart disease is the No. 1 cause of death for men and women in the United States. Heart disease is responsible for one of every four deaths – but there are steps you can take to prevent heart disease. Nurse Practitioner Justin Swartz from Truman Medical Centers staffs the Specialty Clinic at Swope Health. Swope Health offers cardiology services in our Specialty Clinic, where Truman Nurse Practitioner Justin Swartz is all about preventive care for a healthy heart. Blood pressure control: Keep that top number less than 100 and the bottom number less than 80. Cholesterol control: Keep the LDL (the bad one) less than 100 and the HDL (the good one) greater than 45. Blood sugar control: Justin likes the A1C test. 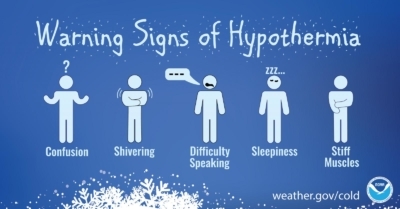 It is an average of your blood sugar levels over a three-month period. You want that number to be less than 5.5. Tobacco control: Smoking is linked to many heart ailments. Just stay away from it or do everything in your power to quit. Fitness control: You have to be active – walk, run, do yoga, bike, dance, swim – ANY physical activity will be a benefit to your heart. If you are not sure about your numbers, that is a good reason to find out. Make an appointment with your provider for a check-up to learn about your current health and ask about recommendations to improve your heart health. Once you learn about heart health, we hope you will spread the word to your family, friends and everyone you love. Join us in providing encouragement to quit smoking, manage high blood pressure, add exercise to every day’s routine and make healthy food choices. Call us at 816-923-5800 to schedule an appointment and take steps toward a healthier heart. 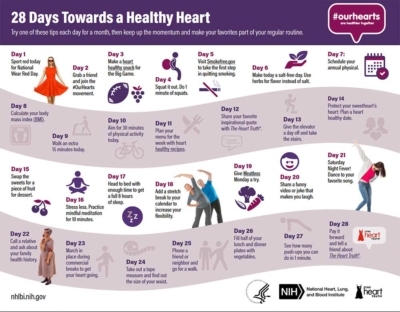 https://www.swopehealth.org/wp-content/uploads/2019/02/28-days-to-a-healthy-heart.jpg 779 1000 Swope Health http://www.swopehealth.org/wp-content/uploads/2018/11/swope-logo-rev-750.png Swope Health2019-02-19 13:46:332019-02-19 13:51:51Have a Healthy Heart! Feb. 7, 2019, is the National Black HIV/AIDS Awareness Day – a day dedicated to outreach and education about the disproportionate impact HIV and AIDS has among African Americans. Swope Health, along with the Centers for Disease Control and Prevention, wants you to have an opportunity to get tested for the human immunodeficiency virus (HIV) and Autoimmune Deficiency Syndrome (AIDS). Swope Health offers HIV/AIDS testing as part of routine healthcare. On Feb. 7, we will have a special table set up in the lobby at Swope Health Central to talk with clients and encourage testing. According to the CDC, in the United States, about 1.2 million people have HIV, and a disproportionately high number of that total – 40 percent – are African Americans. 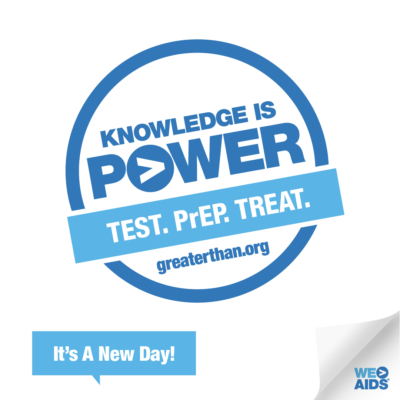 Further, about 14 percent of people with HIV are unaware they have the disease. People infected with HIV can unknowingly spread the disease to partners and may need medical care for their own health. That is why testing is so important. There are several types of tests available, but the most common examines a sample of blood for the presence of antigens or antibodies as a reaction to the virus. Most labs offer this routine test, or a rapid-screening version. At Swope Health, if your test comes back negative, you can be confident you do not have HIV. If the rapid test is positive for antibodies, Swope Health providers recommend a confirmatory lab test to verify. With a positive test, your provider will talk with you about treatment options and will refer you to our partners at KC Care Health Clinic. By Michelle Keller, Vice President, Community Engagement, Development & Outreach. Hello! Do you see something different here today? 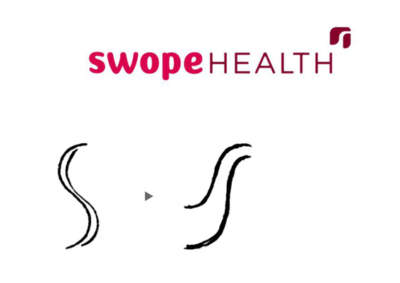 We have created a new look for Swope Health, at the same time we celebrate 50 years of service to our community. The leadership team and Board of Directors agreed a new look would be an excellent way to kick off our next 50 years. As we reflected on our years of service, we also evaluated how we perform – our strengths, weaknesses and opportunities. We identified four pillars to define our service to the community, and we re-imagined how we could show you our commitment, starting with our name. The new look should guide us into the future. Understanding: We relate to you, no matter where you are in your healthcare journey. Invested: We’re committed to the communities we serve and the people who need care. Accessible: Our knowledge, services and caring providers are available to everyone. Skilled: Our staff delivers high-quality, expert care at every moment. 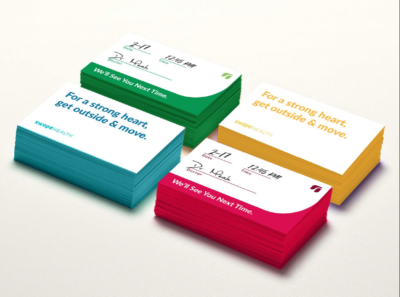 We worked with a professional branding firm, Native Digital, whose team challenged us with a question: If Swope Health was a person, what kind of person would we be? We came up with three ideas: We would want you to think of us as a friend, counselor and advocate. As a friend, we listen, care about you and work hard to have mutual trust. We speak your language. As a counselor, we drive you to better understand yourself and to become the best you can be, through empathy, guidance and wisdom. As an advocate, we are invested in your success and we boost you up so you can achieve your goals. We’re with you on your path to health. And it’s that idea – a path leading to a healthier, happier life – that sparked the change to the logo. We widened the bottom of the “S” to make it look more like a path, the flowing start of a journey. We also simplified the look of the lettering and made it less formal, more friendly. Then finally, we jazzed up the colors! We want to be clean, bright and fresh. You’ll see vibrant colors throughout our presence: pink and maroon, dark blue and light blue, dark green and light green. All of this comes together in our new look. I hope this gives you a peek into our thinking and I hope you will see us in a new light. Let us know how we’re doing in meeting our pillars and serving as your friend, counselor and advocate. Comments always welcome – use the text box below or send an email to editor@SwopeHealth.org. https://www.swopehealth.org/wp-content/uploads/2018/12/Appointment-Cards-400x297.png 297 400 Swope Health http://www.swopehealth.org/wp-content/uploads/2018/11/swope-logo-rev-750.png Swope Health2019-01-03 06:00:052018-12-24 12:24:38New Year, New Look! Mission Possible: The Best Champs Holiday Party Ever! 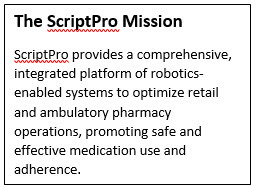 ScriptPro, a Kansas City-area company that provides pharmacy software, robotics and management programs, has taken on a new task this quarter. The company’s employees, part of a program called Community Connection, are putting on a holiday party for the SHS Champs program. The Community Connection team surveyed the approximately 800 ScriptPro employees and found a passion for children’s needs, fighting hunger, supporting cancer research and caring for animals. The team partnered with Harvesters, Kansas City’s community food network, in the first quarter of 2018; with PurpleStride, a non-profit that raises funds and awareness of pancreatic cancer, in the second quarter; and with KC Pet Project in the third quarter. For the fourth quarter and the holiday season, the company looked for a way to support children in need. Since the company already had a connection with SHS – the Swope Health Services Pharmacy uses ScriptPro products – it was an easy decision to host the party for the kids in the Champs program. The ScriptPro-SHS planning team at an October meeting, from left: Joi Franklin, Electrical Quality Assurance Technician II at ScriptPro; Amy Kuhnlein, SHS Manager of Development and Community Affairs; Kristen Meschede, Customer Communications Manager at ScriptPro; Elgie Hurd, SHS Supervisor, CPRP; Tiffany Clinton, SHS Supervisor, CPRP; and Erin Pagel, Manager, Strategic Pharmacy Services at ScriptPro. 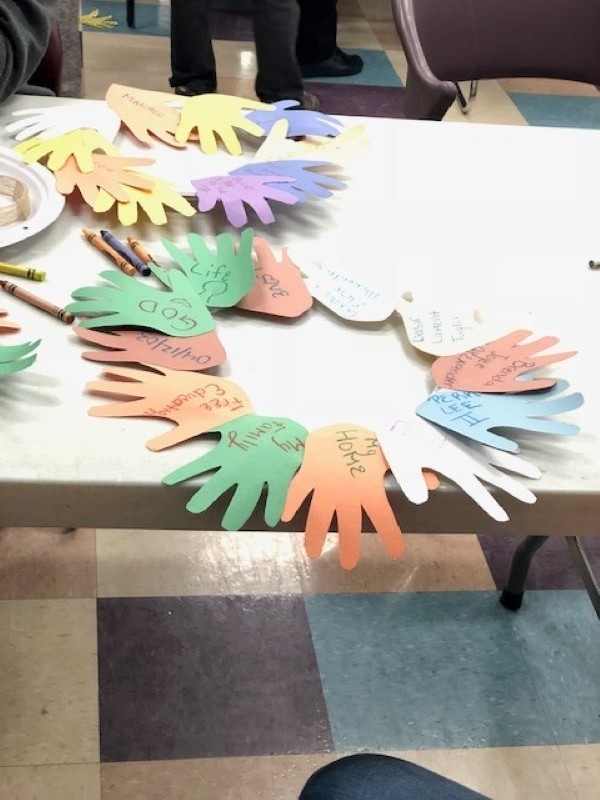 Champs is a monthly youth group for children aged 5 to 17 who are enrolled in the Community Psychiatric Rehabilitation Program (CPRP), said Tiffany Clinton, Community Support Supervisor. The program serves an average of 50 children each month with different life-skills topics and age-appropriate activities. The children in the Champs program face numerous challenges, including physical and verbal aggression, impulsivity, maintaining focus in the classroom, suspensions, struggles with depression, and homicidal or suicidal thoughts, Tiffany said. Some children are in the family court system and others have received inconsistent care with medication and treatment plans. Some have been hospitalized for mental illness and related issues. “These kids face issues no child should have to face,” Tiffany said. ScriptPro’s Community Connection team agrees, and intends to create a memorable and fun celebration for the Champs kids. For the party, the team will convert the activity rooms in Building C into a “Winter Wonderland,” with a Christmas tree and activity stations featuring cookie and cupcake decorating, ornament making, making and decorating goodie bags and other crafts. The team’s plans include a Karaoke station, a snowman bowling game (think of a snowball knocking down snowman pins), and a station for temporary tattoos. A costumed Olaf, the snowman from “Frozen” movie fame, also will be at the party on Dec. 19, 2018. There will be a photo booth, and kids can use the photos to create personalized ornaments to take home. The celebration will include a meal, as well as personalized holiday gifts for each. Kaitlin Xouris, ScriptPro Digital Brand Strategist, is participating in ScriptPro’s Toy Drive for SHS Champs participants and Toys for Tots. There’s a competition at ScriptPro to see which member of the leadership team can bring in the most toys. In early December, Bill Thomas, ScriptPro’s Executive Vice President and Chief Operating Officer, was in the lead over Lindsey McDonald, Director of Product Configuration Management, Field Operations, and Tony Goble, Vice President, Customer Service. The winner of the competition gets the honor of dressing as Olaf, the snowman from Frozen, for one day. 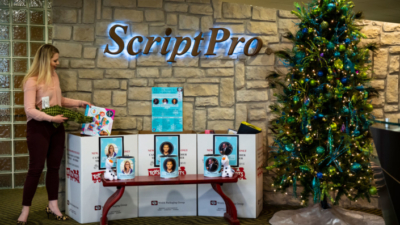 The ScriptPro team held a friendly competition among departments to see which could bring in the most toys for the Champs program, Erin said. 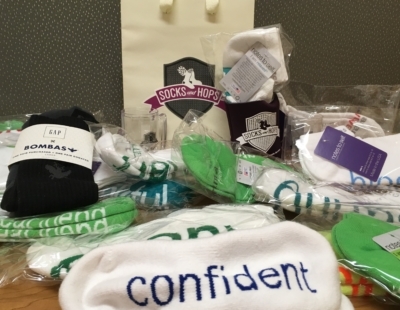 “We want to make sure every kid gets at least one gift, if not more,” Erin said. Putting on such a celebration takes a lot of volunteers. Erin noted that the team is working in three shifts: the first has employees who are doing the advance work of creating craft kits, baking the cookies and cupcakes for decorating, and designing the decorations for the activity room. A second shift will handle the transformation of the room and set up all the activities. And the third shift will host the party and then clean up after the event. More than 30 employees signed up to participate in the first week alone. Would you like to support the Champs program? Donations are always welcome, either in cash or assistance with programming items – like hygiene kits, daily planners, or craft supplies. 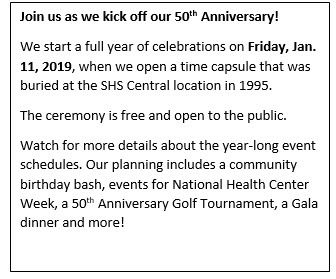 Contact Shantelle Wells (816-599-5252, SWells@swopehealth.org) or Jaclyn Powell (816-599-5243, jrpowell@swopehealth.org) for more information. https://www.swopehealth.org/wp-content/uploads/2018/12/Q4_Group-Photo-705x451.png 451 705 Swope Health http://www.swopehealth.org/wp-content/uploads/2018/11/swope-logo-rev-750.png Swope Health2018-12-07 06:00:422018-12-24 12:14:46Mission Possible: The Best Champs Holiday Party Ever! The Barnes & Noble Bookstore on the Country Club Plaza has named Swope Health Services as the recipient of its annual Holiday Book Drive. This is the third time in four years Barnes & Noble has selected SHS to receive books donated by its customers. 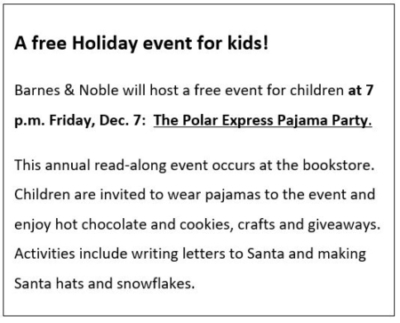 All customers who visit the Plaza Barnes & Noble store, 420 W. 47th St., Kansas City, MO, through Dec. 9, 2018, are invited to purchase books for SHS children’s programs. SHS will provide the books free to children of all ages who visit SHS clinics for healthcare and behavioral health services. “In the past, we have worked with Swope Health and it’s been a great success,” said Joseph Harris, assistant store manager at the Plaza Barnes & Noble. The book drive launched at the end of October and will wrap up at the end of the first week in December. Joseph said the drive is on pace to produce more than 1,000 books. Customers can choose their own childhood favorites or select from SHS- or Barnes & Noble-recommended titles. Barnes & Noble keeps a supply of recommended books at every checkout counter, making it easy for customers to select a book for the drive at checkout. The SHS list was developed by professional therapists and counselors in the Children’s Community Psychiatric Rehabilitation Program, which works with children from ages 5-17 who experience trauma or behavioral health issues. The reading list includes books featuring characters in similar situations and provides stimulus to work through challenges. “Reading is magic,” said Tiffany Clinton, Supervisor, Children’s Community Psychiatric Rehabilitation Program at SHS. Barnes & Noble, a national chain, encourages book drives at all of its local shops. In its 2017 book drive, Barnes & Noble helped deliver more than 1.6 million books to more than 650 local charitable organizations serving disadvantaged children across the country. The Plaza Barnes & Noble has donated books from its Holiday Book Drive to SHS in previous years, providing SHS more than 1,500 books in 2015 and again in 2017. SHS volunteers will also help wrap presents at the store throughout December. “We love our partnership with Barnes &Noble,” Amy said, adding SHS will distribute the books through its children’s programs and pediatric health care clinics. SHS healthcare providers also use the books to help assess a child’s cognitive and physical development and talk with parents about the importance of reading to their children. Research has shown that reading to young children produces benefits including increasing vocabulary, curiosity and memory and improving listening skills. The American Academy of Family Physicians describes a positive association with books and reading as a foundation for scholastic success. 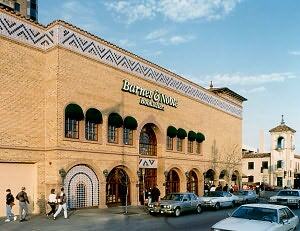 You can support the book drive by visiting the Barnes & Noble on the Country Club Plaza, 420 W. 47th St. The store is open Sundays from 10 a.m. to 7 p.m. and Monday through Saturday from 9 a.m. to 9 p.m. On Dec. 24, the store is open from 8 a.m. to 6 p.m. and closed on Dec. 25, Christmas Day. The store reopens from 8 a.m. to 9 p.m. on Dec. 26. Here’s a big shout-out to KCCAN! (Kansas City Children’s Assistance Network), which has provided an $11,000 grant to the Champs program at Swope Health Services. 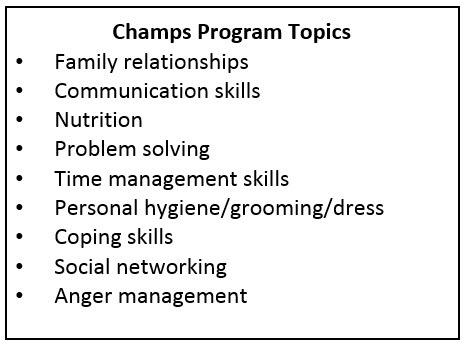 The Champs program is a monthly youth group for children ages 5 to 17 who are enrolled in the Community Psychiatric Rehabilitation Program (CPRP), said Tiffany Clinton, Community Support Supervisor. The program provides education on different life-skills and age-appropriate activities for an average of 50 children each month. Champs program members exercising creativity in an exercise, and some products from recent programs. For example, an activity might include a community field trip, such as the October visit to a pumpkin patch for younger children or learning how to use the city bus system for older kids. Topics are drawn from the Daily Living Assessment-20, a behavioral health care tool that measure aspects of daily life that might be impacted by trauma, mental illness, disability or behavioral disorder. Programs are held after school, usually from 4:30 to 6:30 p.m. and often include physical activity. The goal for all of the programs is to help participants develop skills in self-sufficiency, independence, and confidence to live meaningfully in the community. The sessions use role-playing and behavior modeling in real-life situations. The programs might touch on topics like anger and emotions and include coping skills. Participants are provided with resources to continue working on life skills at home. For example, a program on grooming and hygiene might provide the kids with soap, toothpaste and other supplies, while a program on time management might include a daily calendar and planner book. 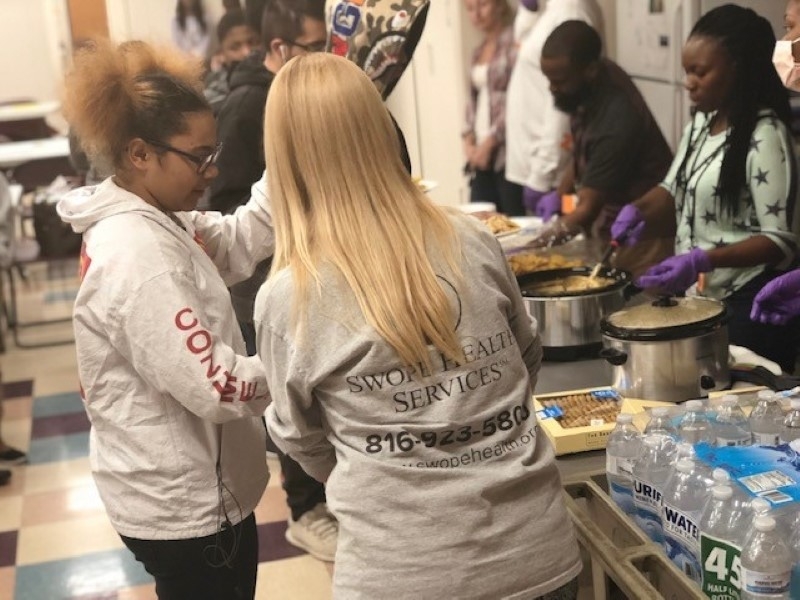 KCCAN is a not-for-profit organization focused on funding programs that improve the quality of life for Kansas City’s children, especially projects related to meeting basic needs, education and wellness. At SHS, the KCCAN funds will be used for the monthly programs starting in 2019 and will also support the annual Thanksgiving and Holiday celebrations for the kids. 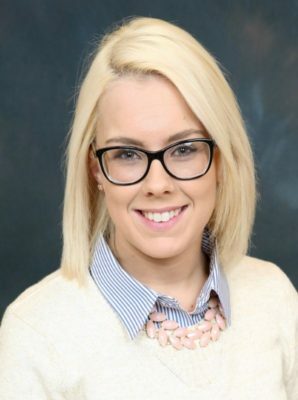 “Our kids in the Champs program face numerous challenges, including aggression, difficulty at school, struggles with depression, even homicidal or suicidal thoughts,” said Tiffany. The staff at Swope Health Services-Independence has launched an all-hands-on-deck initiative to identify diabetes in their patients, help manage the chronic disease, and most importantly, work to prevent it. The program is the brainchild of Dr. Naiomi Jamal, who holds both a medical degree and Master’s degree in public health. “I am always focused on prevention,” said Dr. Jamal, noting that the clinic serves a high number of patients with hypertension, obesity and diabetes. According to the Centers for Disease Control and Prevention (CDC), more than 30 million people in the U.S. have diabetes. Diabetes is the No. 7 cause of death, and the No. 1 cause of kidney disease, limb amputation and blindness, Dr. Jamal said. In addition, one in three people have pre-diabetes, and 90 percent of them do not know they are at risk, she said. The initiative at the Independence clinic begins with a specific diabetes checklist used with every patient to look for early signs of those three dominant diabetes-related issues: kidney disease, limb amputation and blindness. At least once a year, all patients are asked to complete lab tests to evaluate kidney function and receive a foot screening. Diabetics are also predisposed to infections such as pneumonia and influenza. Their vaccination status for both these conditions is updated and monitored at every visit. Starting in November, the clinic will add one more exam: an annual eye test to capture images of each patient’s retina. Those images are then examined by an optometrist for abnormalities linked to diabetes. “In every visit, we try to make sure we are not missing anything,” said Dr. Jamal. A second component of the initiative is counseling. In addition to medical treatment, patients are offered personal sessions with a chronic disease counselor and group visits with a trained and certified diabetes educator. These small group sessions – 10 or fewer patients and their family members – are held every six to eight weeks at the Independence clinic. Topics include a detailed explanation of diabetes, insulin and medications, and steps to take to better control diabetes with diet and exercise. Dr. Jamal has seen the group sessions produce results. She recalled one patient who had been under care for about a year but had difficulty controlling her diabetes. The patient reported to Dr. Jamal that she was taking her medications, but in reality, she wasn’t. 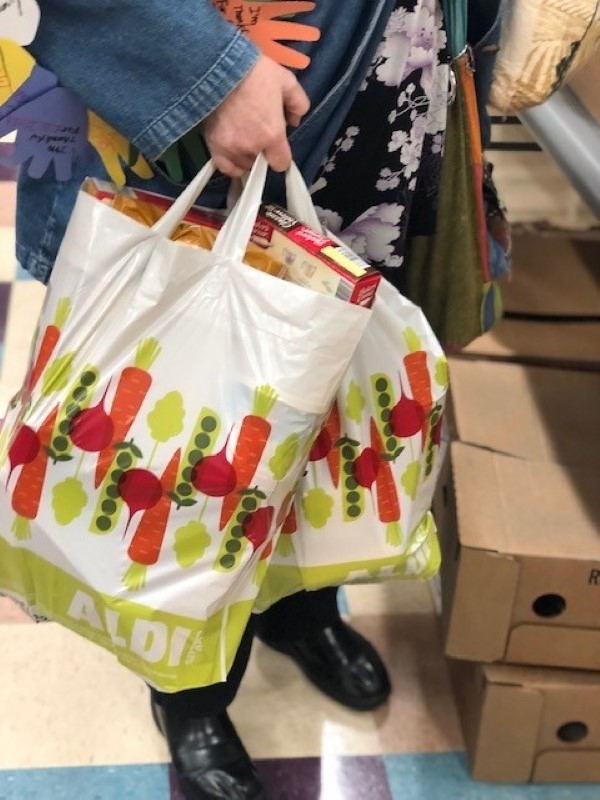 When she came to a group session, she encountered another woman from her neighborhood who talked about how she had been able to manage diabetes – using the same regimen the patient was prescribed. “That peer interaction did something,” Dr. Jamal said. “My patient decided she, too, could be successful, and she started taking her medication.” That patient now has been able to control her diabetes. The diabetes initiative has been operating for nearly a year in Independence, and as checklists are completed on more and more patients, the results are starting to show promise. This includes higher rates of diabetic foot exams, vaccinations, renal disease screening, and overall diabetic control (compared to the same period last year, before the program was introduced). “This truly is a team effort,” Dr. Jamal noted. Starting with Patient Service Representatives who schedule and remind patients, to nurses and medical assistants who review patient histories in pre-visit sessions, to clinic staff who print out flyers and educational materials, counselors who educate and providers who diagnose and treat – all play important roles in reaching patients and encouraging the changes that drive results. In 2019, this checklist approach – with lessons learned from Independence – will be rolled out across all SHS clinics. 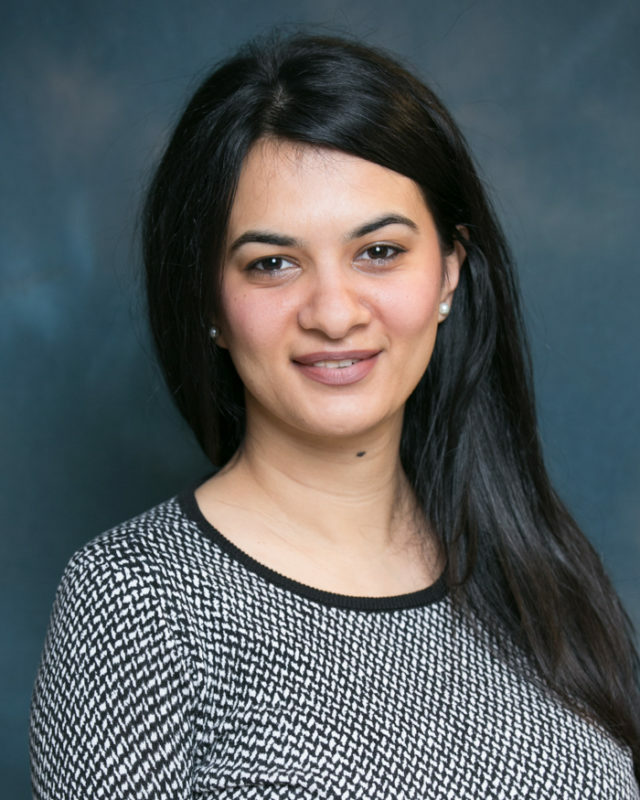 “It is so very difficult to make healthy choices,” Dr. Jamal noted, “but we can make it easier.” For people who are diagnosed as pre-diabetic, lifestyle changes can frequently mean avoiding medication. “Prevention is possible,” she added. In this month of diabetes awareness, it’s a good time to make an appointment for an examination. Call 816-923-5800 to schedule an appointment. SHS can help prevent diabetes in some cases, and if you have diabetes we can help with medication and education, including nutrition guidance, to lessen its impact on your life.